Drayton gets on stage with his mom and dad. 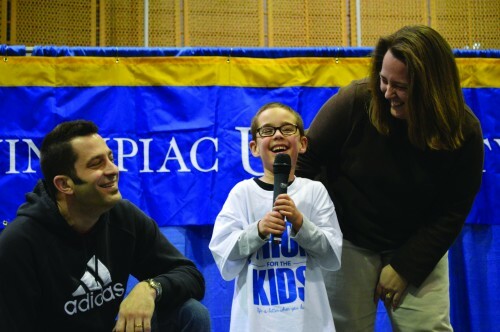 He takes the microphone with his two hands and when he tries to speak, he breaks out into giggles, throws his head back and looks to his parents. The crowd follows with laughter and cheers. “I was in the hospital for five months and five days,” he said. 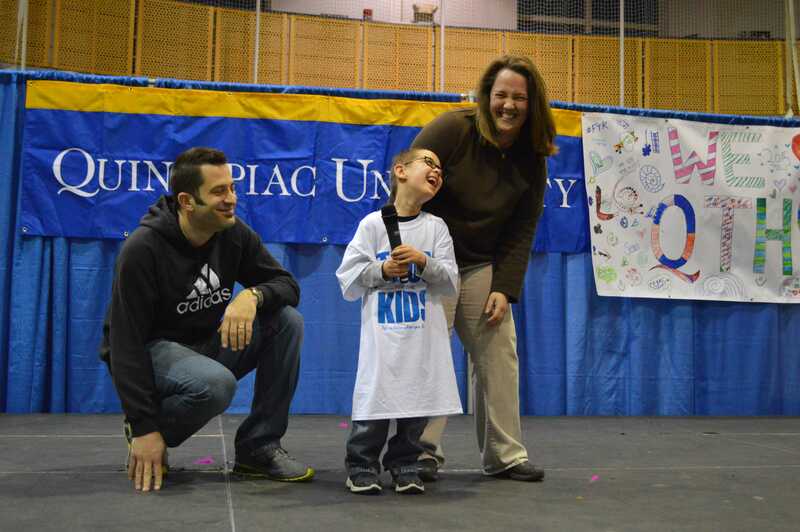 Six-year-old Drayton Brindisi was born at 23 weeks, 17 weeks earlier than his expected due date. His mother, Heather Brindisi, said he weighed 15 ounces. To put it in perspective, that’s less than a pound of deli meat. The Brindisi’s live in Ellington and the family went to the Connecticut Children’s Medical Center when Drayton was born. Drayton went through a series of surgeries while in the hospital. 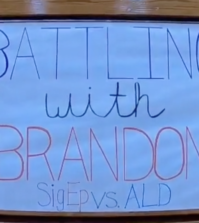 Multiple specialists worked with the Brindisi family while Drayton was in the NICU (neonatal intensive care unit). Drayton went home with a feeding tube and it was finally removed when he could start eating by mouth at age. “We want to continually tell you guys how appreciative we are for you guys doing this and raising funds for the hospital because he never would have been here if they hadn’t had all that expertise there, so thank you very much,” Heather said. This was the Brindisi’s first time at Quinnipiac. “We’ve done a lot of different fundraising things. This is actually our first QThon and we did HuskyThon last year. 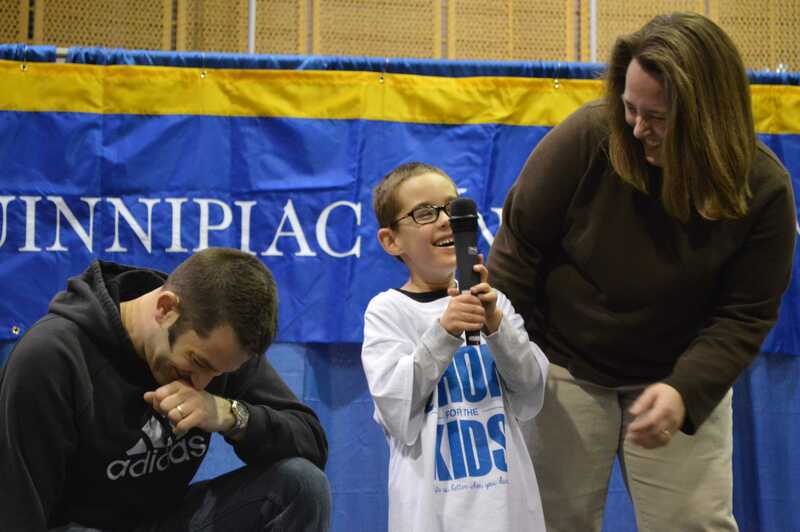 And my wife and I both work at a school and they did one this year, so we’re regulars now,” Andrew Brindisi said. QThon is a dance marathon that raises money for the Connecticut Children’s Medical Center. 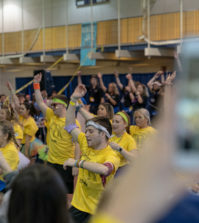 At this event, students and organizations on campus come together and dance for a cause. Different families, who have in the past or currently go to the medical center, attend the event as well. Drayton and his family go back to the hospital every now and then to visit the nurses and to see the NICU Drayton stayed in. “The nurses are very nice,” Drayton said. Drayton rarely stood still in Burt Kahn Court as he weaved in and out of the crowd, going up to random students and giving them hugs. “How many more questions? How many?” Drayton asks. “Why don’t you say ‘what school do you go to?’” he said. His favorite things to learn about in his elementary school, Windermere, are writing and reading. His favorite books are the how-to ones, epecially ones about brushing teeth. “He’s a very energetic and social child,” Heather said. Drayton gets up and shows off his favorite dance moves like nobody is watching. 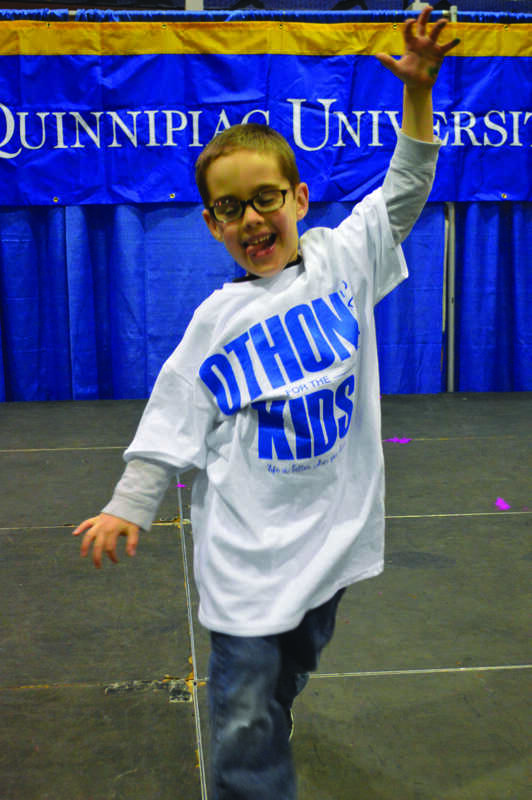 His QThon shirt hangs down to his knees and he jumps up and down and waves his arms in the air as he makes funny noises. 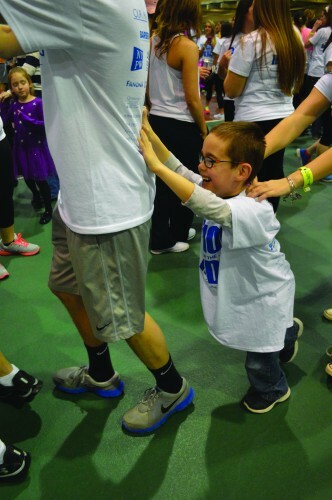 The fundraising teams that raised the most money got the privilege to spend time with a child at QThon. Justin Capella, a team fundraiser, hung out with Drayton and ran after him as he gave out free hugs. 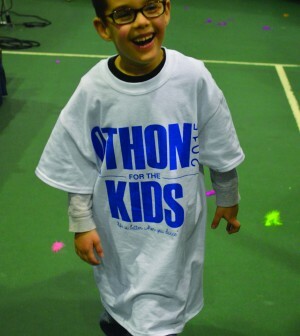 QThon raised $55,018 this year, hitting a new fundraising record for kids just like Drayton.